Natasha Kraevskaya (1972) explores a common man’s desire for beauty and sublime that was challenged by the economic and cultural conditions of a post-communist reality. 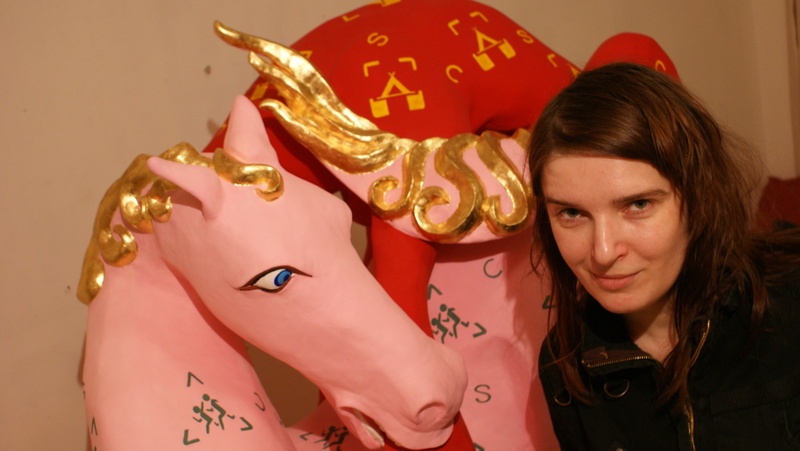 Known for her papier-mâché and concrete sculptures, objects and acrylic painting that combine neo-pop art approach with punk, trash art and arte povera, she also recently made a name for herself with a conceptual examination of late Soviet “Lenin cult” in her Manifesta 10 project in collaboration with Ilya Orlov. Kraevskaya's works are often humorous and provocative, making viewers smile and think as well. She lives and works in St. Petersburg, Russia. "I am interested in the process of exchange between the profane environment and cultural archive - beyond the position of any arrogant antagonism; not frightened of beauty as a manifestation of satisfied needs or of proximity to kitsch. Indeed, I find the kernel of truth and reality there. The common idea of beauty nourishes the substance of ersatz-culture, which is universal in its displays, does not contain a message, mute, and represents only a “decorative element of a profane environment”. Kitsch is international – in the common consent of the people, who satisfy their desire for beauty and the sublime - in an accessible, understandable form. My desire is to change its borders. This task is documentary and biographical. I work with symbols which are native to an ordinary spectator, and these symbols become a medium to pose my questions, reminders and a means to demand attention". The State Hermitage Museum’s International Youth Educational Centre, St. Petersburg. 2015 - What about love? The State Museum of Urban Sculpture, St. Petersburg.